Today’s idea is very simple. Kreisler Manufacturing is a profitable, cash generating manufacturer with an over-capitalized balance sheet. Kreisler’s market perception suffers from the results of some poor decision-making a few years back, but the company has fully recovered from its mistakes. Once the market recognizes Kreisler’s restored earnings power and excess assets, the company’s market price may rise to reflect its value. Kreisler Manufacturing provides pipe and tube assemblies and manifolds for aerospace and industrial turbine applications. The company is based in New Jersey and has been in business since 1968. Throughout the late 90s and into the mid-2000s, Kreisler’s business was plagued with low margins and the company posted continual losses. However, Kreisler’s fortunes would change. From 2005 to 2008, Kreisler’s revenues rose 103%, gross margins nearly quintupled and net income climbed from near break-even to just under $2 million in 2007 and 2008. Cash piled up, accounting for 36% of assets in 2008 against nearly no debt and leases. Things were looking bright for Kreisler, but then two things happened. One, the financial crisis came along and crimped revenues and margins. Revenue slumped 19% between and 2008 and 2010, but gross profits cratered, falling 77%. (It seems likely that Kreisler bid for projects at razor-thin margins just to keep its factory running and its workers employed.) However, despite the difficulties posed by the severe recession, Kreisler’s worst wound was self-inflicted. In 2010, Kreisler decided to set up a manufacturing facility in Poland. Kreisler invested millions in the venture. The Polish government also kicked in multiple millions in grants to encourage the development. The project was a disaster. Despite spending millions on facilities and equipment, the Polish subsidiary produced only endless operating losses, crushing Kreisler’s profits from 2010 on. Kreisler finally pulled the plug on the boondoggle in 2012, selling the entire subsidiary for a pittance. (Literally less than you likely have in your wallet at the moment.) Kreisler wrote down the subsidiary’s entire value and also off-loaded some liabilities in the process. The resulting loss pushed the company’s reported net income to negative $2.8 million in 2012. Yet, this large reported loss disguised a strong recovery at Kreisler’s domestic operations. Despite reporting the $2.8 million loss in 2012, the company’s continuing operations actually earned $2.34 million in 2012. Since writing off its Polish operations and re-focusing on the domestic business, Kreisler has thrived. Gross margins have rebounded to around 15%, while operating margins are hovering around 10%. Revenues have fallen off slightly since 2012, but the company has been able to maintain its margins, protecting profitability. Most significantly, Kreisler’ has produced serious cash flow since the exit from Poland. Some of this cash flow was due to one-time items like a large tax refund, but the greater credit is due to better working capital management. Kreisler’s inventory levels are sitting at 47 days of trailing sales, compared to a high of 108 days of trailing sales in 2010. Due to the improved operating results and strong cash flow, Kreisler’s balance sheet has never been stronger. Of Kreisler’s $9.19 million in cash and short-term assets, at least $7 million is likely excess. Kreisler could distribute or otherwise spend down $7.36 million in cash before its current ratio hit 2.50, still a very healthy buffer. At Kreisler’s current share price, the market is largely ignoring this surplus cash. Kreisler appears to trade at 11.1x trailing earnings, but the company really trades at only 6.9x earnings once excess cash is netted out. 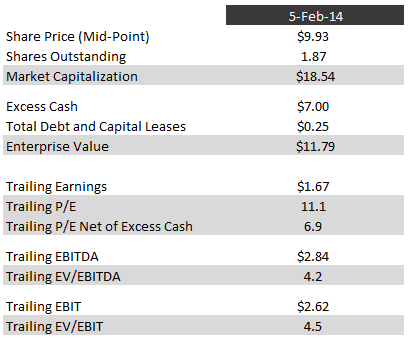 The company also looks very cheap on EV/EBITDA and EV/EBIT, coming in at 4.2x and 4.5x respectively. Though Kreisler looks very cheap on a trailing earnings basis, two questions remain. 1. Will Kreisler’s earnings hold up? Defense contractors account for a large portion of the company’s revenues, and a reduction in defense spending could reduce demand for the company’s pipes, tubes, and turbines. With the US backing off from more than a decade of war footing and with every budget item drawing close scrutiny, the possibility of reduced demand is real. 2. What will Kreisler do with its excess cash? That cash is only worth face value or more if it is used productively for the benefit of shareholders. If the cash is squandered in poor investments or simply allowed to languish on the balance sheet forever, returns to shareholders will be reduced. Kreisler seems to have gotten the message about blowing capital on risky foreign ventures. The company paid a 50 cent special dividend at the end of 2013. There’s a lot of cash left to use before we can conclude it’s been allocated effectively, but the chances of another massive and ultimately failed expansion seem low. In my view, the risks of declining revenues and poor use of the company’s cash are outweighed by the extremely low valuation and strong balance sheet. I was starting to get interested, in spite of declining sales, until I saw that 54 % of sales went to one customer and 20 % to another. Unless the company really does spectacular work, it looks like they would be vulnerable to getting their pricing squeezed. Customer concentration is an issue for Kreisler. However, the company has been working with these clients for years and I think it is unlikely that a military contractor would change suppliers mid-stream and risk quality and supply chain issues. If Kreisler’s gross margins were in the 30s I would be more worried about potential squeezing, but at 15% I think their clients realize there is not a ton of room to push before Kreisler would lose its economic viability. This is quite interesting, particularly when you notice that their backlog is near an all-time high. If you use 2012 figures for an estimate of what a backlog >$40mn looks like, its quite a bit cheaper than it even appears using TTM figures. Could be. Looking at backlog figures is an under-used but valuable analysis tool. Interesting company. In my previous life I owned/managed a business in automotive with a very similar business model. 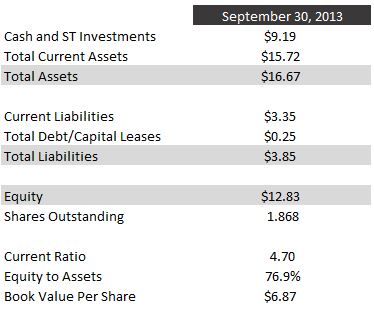 They have a boatload of cash, however PP&E seems to be about fully depreciated. Anyone talk with management to see if this is economically depreciated or just accounting wise depreciated? Might need $6-8 million to refresh the equipment. Some equipment in the manufacturing industry will run forever if properly maintained, if this isn’t the case for them that boatload of cash may not be so excess. Also potentially of value is the roughly $1.5 mill in capital losses on the books. This has a full valuation allowance against it and can only be used to offset capital gains and not ordinary income, but could be worth some dough if they can monetize it. All good points. I did notice that management has been avoiding nearly all capex in recent years. I am not sure if they over-invested in previous years, anticipating big growth, or if their equipment really is nearing the end of its economic life. If that is the case, management’s conservation of cash makes sense, though it would seem strange to hoard cash for years while letting equipment wear out, only to then splurge on new equipment. Seems more disruptive to the business than simply replacing equipment gradually over time. Their equipment seems both economically and financially fully depreciated. The building is old and utilized almost 100%. My understanding is they are cautiously looking to expand through acquisition and also to move to newer facilities down the line. However management is extremely conservative hence the company never made any moves other than failed venture to Poland. In immediate future they are looking to change systems used internally for an ERP (9-12 months frame time). One interesting piece I also learned is that company started about 100 years ago as jewelry company and during WWII they got involved in aerospace manufacturing and became the company that it is today. Thanks for the history! Fascinating how companies change course over time. Just saw that the company ended up being acquired for $18 in cash.